I have about 15 medium sized shrimps left in the freezer and not knowing what to do with them. Keeping them too long in the freezer will not be good so I decided to make a simple dish out of them. Yup, cooked them in tomato ketchup for once would be nice. Simple to cook and savoury in taste. 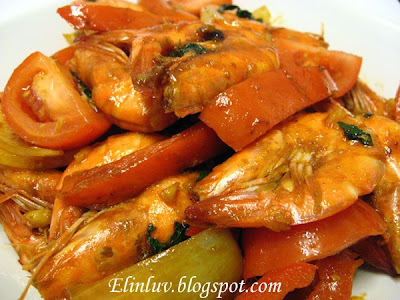 It will whet the appetite definitely and the aroma while cooking is indeed heavenly…garlic being sautéed and the shrimps gives out the salty sea scent while being stir fried in a wok hmmm delicious! Heat up the wok, add in oil and sautee the garlic till fragrant, add in the shrimps and stir fry till it turned red. Add in capsicum, tomato , onions and stir fry till cooked. 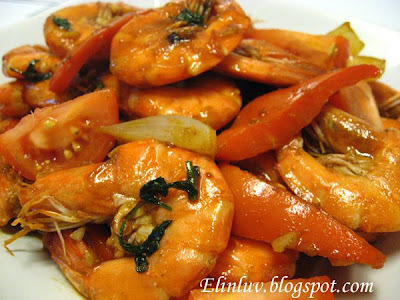 Add in the tomato ketchup, sugar and salt and stir fry till the shrimps are coated with the tomato ketchup. Add in cooking wine and a bit of water if you want to have a bit of gravy. When ready to dish up, add in the parsley . Served hot. Some people like to have a bit more gravy, but for me , I perfer just to have the shrimps coated with the savoury sauce :) That's why you don't see much gravy on this dish! Simple to cook especially for a full time working momsie like me ^ * Haha, infact I prefer to cook one dish meal for just the two of us when my Piggies are away at college so that I have all the time for my baking (",) Can? 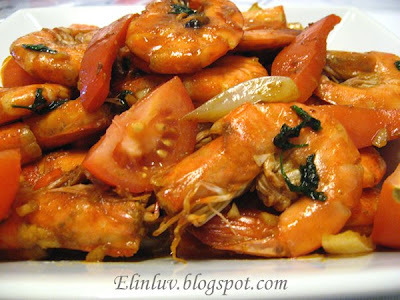 Previously was the prawn curry, now prawns in tomato sauce...hmm hungry liao. I love prawns very very much. The JOY Of Domestic Baking And Cooking.